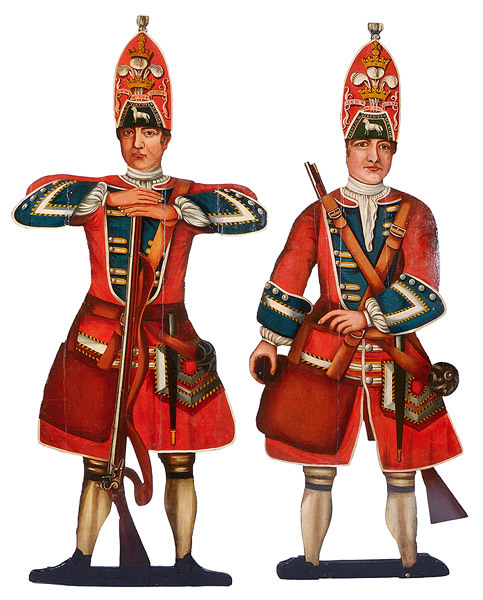 These two life-sized figures depict Grenadiers of The Queen's Royal Regiment. It is thought that they were made about 1715 when part of the Regiment was quartered in Carlisle. It was customary at the time for figures such as these to be displayed outside Inns to advertise the presence of a recruiting party. For many years they were to be seen at the Bush Hotel and then the County Hotel in Carlisle before being restored and generously presented to the Regiment in 1938 by Colonel R G Clarke CMG DSO who commanded the 1st Battalion from 1925-28. The motto and the lamb on the mitre-shaped caps are those of the Regiment, although the lamb is not a paschal lamb. The feather badge of the Princess of Wales above them defines the period as being from 1714 to 1727. She was the daughter-in-law of George I who did not have a Queen Consort. The Regiment was styled The Princess of Wales's Own Regiment of Foot during those years. When she became Queen Consort after George I died in 1727, the Regiment once more became The Queen's Royal Regiment. Their weapons are a flint lock musket, sword and socket bayonet. The leather pouch carried three grenades. The cartridges for the musket and the match for the grenades may have been carried in the pouch or in the large pockets of the coat, or there may have been a cartridge box on the waistbelt behind. The grenadiers stand with their feet apart which at that time was the position of attention. With both feet together they would be 1 metre 88cm (6ft 2ins) in height, excluding the cap.